All A Bunch Of Momsense: Love the Thunder! 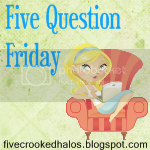 It’s a little late in the day, but I’m jumping in here with Mama M’s 5 Question Friday! Since I’m so late getting started tonight (it’s already 7pm – how did that happen!?) I’m going to just get right down to it. You can play too, just hit up Mama’s blog for all the deets! 1. Thunderstorms – love them or hate them? LOVE! Love love love a good storm. I love the beauty of the clouds as they come together, the stunning displays of lightning, the wild energy that courses through the atmosphere. I love them. I do NOT love that they are usually a migraine trigger for both me and Jeep. Sometimes. We tend to be more of a shop based on need family, and Indiana doesn’t do the “tax free weekend” or anything, so I watch for good sales on things we like, and just roll with it. I’ve found that if I do things like buy long pants for back to school, it stays hot until late October, and everyone outgrows them in that 2 month window. So, if the price is right, sure, but if we don’t need to yet, we’ll wait. Because I do have golfers in my family, I’m not unfamiliar with the game, and I’ve been known to watch on occasion, but it’s not a go-to sport for me. I love indulging in a good, steamy hot bubble bath with a great book and a glass of wine. However, real life dictates that it’s mostly showers for me. 5. What’s the strangest meal you ever ate? I was served fried pig brain once. I didn’t know that was what it was when I ate it, and I wouldn’t intentionally hunt it out anytime soon, but it wasn’t awful. Tasted like chicken nuggets, honestly. So there you are! My 5QF! If you are a blogger, play along & be sure to link up over at Mama’s. If not, but you want to play, just post your answers in the comments! Pig brains? YUCK! I'm too boring when it comes to my food choice; just give me a basic steak and potato and I'm good to go.